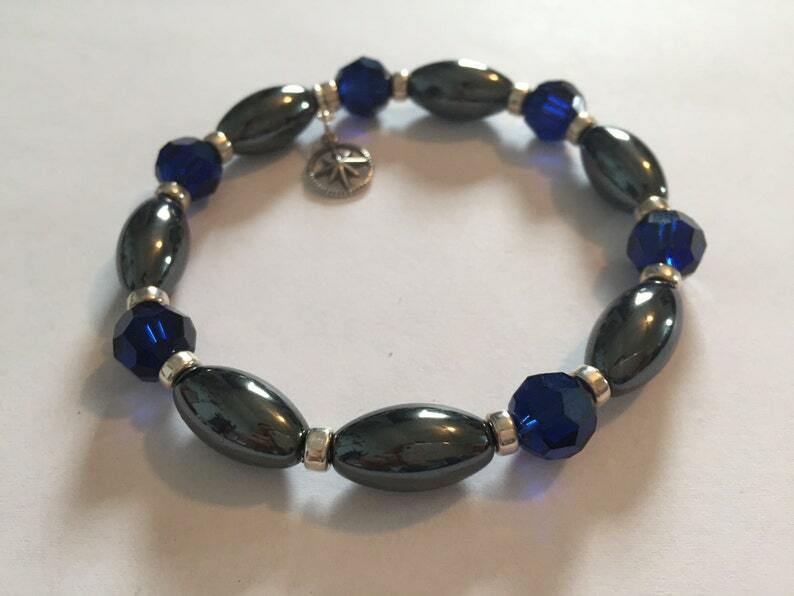 SIZE: Crystals are 10mm, Hematite are 10 x 16mm . Please select 7", 8", or 9". Design may vary somewhat based on size. Pictured are 9" silver, 8" silver. Length is linear, please allow for depth of beads. Stretch cord for ease. ~ Are you changing careers or searching for direction? ~ Do you know you have a greater purpose, but haven’t figured out what that is or how to make it happen? ~ Do you need clarity, focus and ambition to get moving? These Swarovski crystals, genuine hematite stones and compass charm are energetically cleared and infused with sacred energy to help you discover and get you moving on your divine path. The blessing in this bracelet is designed for it to become your direct link to the Divine, so that you will continuously receive all that you are ready for, and exactly what YOU need. The energy transmitted through these crystals is soooo ready and willing to help you with all of your ambitions and will lift you into that space of motivation with such ease that you won’t even be aware that you are manifesting and creating without all the push and pull, promises to yourself, etc. The blessing in these crystals will keep you grounded while gently boosting your drive to succeed. Whether you are focused on your career, school, family, helping others or something else, these jewels will assist you in discerning all the ways your dreams can become a reality for you. Allow yourself to be open to all the possibilities, and be amazed! Hematite is known for its assistance in helping us to release preconditioned patterns and opening up to see other points of view. It is especially known for its ability to help us get grounded, so when we are feeling scattered or unenergetic, it can assist. By helping us to realize that the only limitations that exist are the self limiting concepts within the mind, hematite can help to allow the memory and deeper thought processes to emerge, free from limitation. The properties of this stone can stimulate your mind for higher learning and greater development of logical thought processes, thereby allowing for all of the ambition and motivation that you are ready to take on and be. This bracelet has been programmed to adapt to your individual needs, and will continuously receive unlimited sacred energy. The energy will never "wear out," and the bracelet will not absorb any negative energy, so it never needs to be energetically cleared. If at any time in your journey, you are knowing or sensing that you are not experiencing all that is possible, you can choose in every moment to release the blockages and allow yourself to receive.